If you're an existing or a prospective iiNet customer who wants a no-fuss all-in-one device, and you can afford it, you should look into the Budii. It offers a lot of features and its overall performance should get better as the product matures. Sometimes there's nothing better than a wireless router with the lot. In iiNet's case, though, there is. The company's Labs division has come up with an all-in-one modem-router that not only incorporates VoIP features and storage sharing functions, but also a couple of Android devices and much more. It's called the Budii, and it's an ADSL2+ modem-router with dual-band Wi-Fi and seven Gigabit Ethernet ports. It also ships with an Android-based DECT phone and an optional 7in Android tablet is available, too. The Budii was born in iiNet's Labs and it has a design that's all its own. A wide, white fascia makes it look classy and unlike any other modem-routers on the Australian market. The width of the unit forms part of its function, too; at the top of the router is a contact strip that can be used to charge the Android devices that it supports. You can simply hang the supplied DECT phone and the optional tablet off the router to charge them. It's a smart design that gives you somewhere to keep the devices when they're not being used, and it makes it simple to charge them without having to fiddle with cables and adapters. If you charge both devices at the same time, though, the router will get very warm. We think the Budii looks a little like a radio or stereo device because of the way its ends fan out, and we like the look of it a lot. The ends of the device feature the status lights, which are graphical rather than text-only labels, and they are customisable, which we love. In the Web interface, you can choose from different colours, change the intensity, or simply switch them off if you don't want them to appear at all. It's easy to configure the look of the status lights. Thanks to these indicators, you can see at a glance if something is wrong with an aspect of your network, if someone has left a message on your answering machine, or if a VoIP call is being made, for example. This highly visual element is something we value in a product that's designed to be a home's networking hub. There are also physical buttons on the router that allow you to toggle the Wi-Fi, to pair DECT phones and to power the unit on and off. 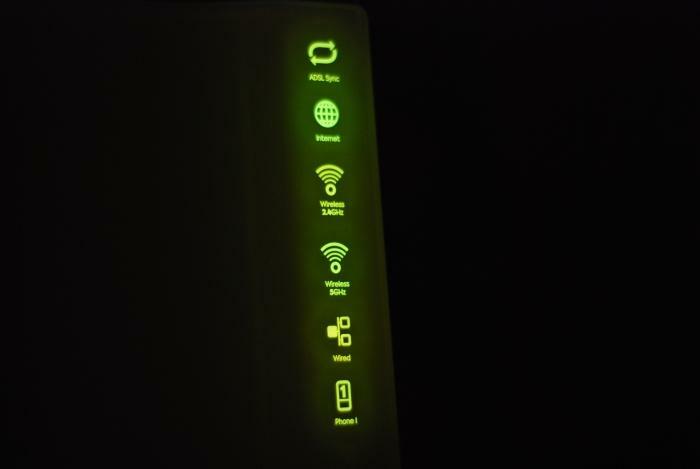 The right-side icons include Internet, Wi-Fi and VoIP status. One thing we don't like about the hardware design is the location of the ports. They are located right at the bottom of the unit and under a lip, so they can be quite hard to access when you want to plug in something new. There is a bar present that helps the unit sit sturdily on a flat surface and you also have to make sure you negotiate this properly while plugging in all the cables. The ports can be hard to access, especially after the initial set-up. The iiNet Labs team has designed Budii from the ground up to be a solution for current needs, but also with an eye on the future. When used in the most basic way, it'll take care of your ADSL2+ Internet connectivity and distribute it to your devices via its seven built-in Gigabit Ethernet ports or the internal dual-band Wi-Fi antennas. The router also supports NBN connections thanks to its Gigabit Ethernet WAN port. Importantly, it has a built-in analogue telephone attachment (ATA) so that you can use any old analogue phone that you have lying around for VoIP and, of course, you get an Android-based DECT phone that's automatically paired with the router. Some future needs have been thought of as well. The Budii has a built-in ZigBee chip, which should allow the router to be used for home automation or electricity monitoring tasks in the future. Indeed, iiNet is working closely with the CSIRO to come up with home monitoring and appliance control devices through new software called SmartLife. Though they are still in their development stage, ZigBee-equipped wall plugs will be able to talk to the router and allow you to control and monitor them through the SmartLife software, perhaps through an app on the Android tablet or phone. In addition to ZigBee, the router has an internal USB port for adding new features, such as anti-virus, for example, and it also has a slot for a femtocell daughterboard, which can help boost mobile phone coverage if you live in area with poor reception. Unlike other routers, the Budii has scope for upgrading. 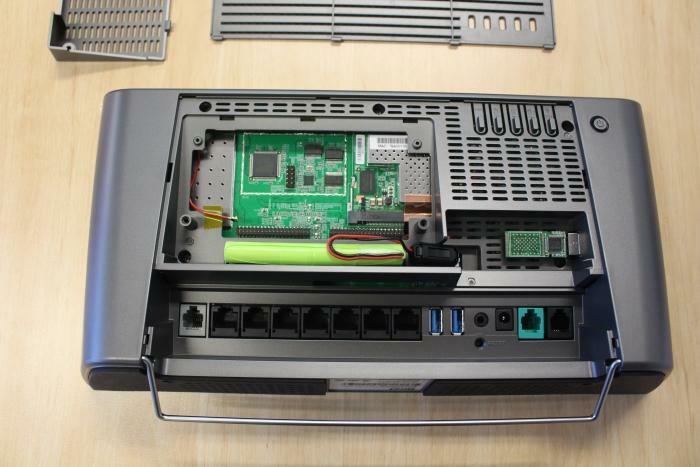 There is a USB port on the right side, as well as a slot for a femtocell daughterboard. A battery is also present for short-term support in the event of a power failure. One other innovation is the built-in audio output, which allows for stand-alone listening to Internet radio streams. Basically, if you intend on putting this router in your living room, for example, you can use a 3.5mm plug to connect it to your stereo system or home theatre receiver and tune in to Internet radio stations. It's a fairly primitive feature at the moment in that you can only activate the audio port through the Web interface, and it's a little clunky to use as far as selecting and playing streams is concerned. The radio streams that can be played through the built-in audio jack. The included streams all go through iiNet's Freezone, so they don't count against your quota, but not all of the ones we wanted to listen to worked. In particular, the Digitally Imported (DI) ones didn't work during our tests, but we did enjoy listening to the SwissGroove station instead. 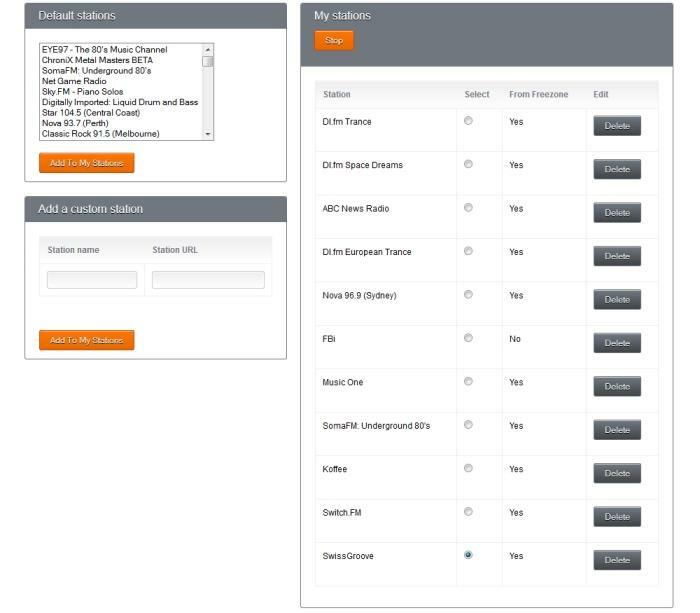 The DI stations did work when we fired up the iiNet app on the tablet and ventured to the radio tab. 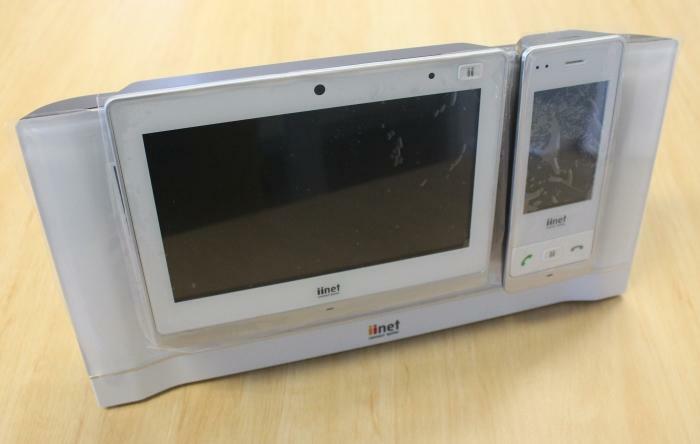 The 7in iiNet tablet looks a little cheap as far as the quality of its screen and its physical design are concerned. It's a heavy old thing, and the extra material for the angled lip at the top of the tablet is what allows it to hook onto the router when it's time to charge it. There are volume buttons along the right side, as well as a micro USB slot and a microSD card slot, and you also get a front-facing camera and a headphone port. It has a solid feel to it and is quite child friendly in this respect, especially considering it's designed to be used in a family environment and to hang off the router while charging. The tablet and the phone hanging on the router. Its home button is all the way at the top-right of the screen, while there are capacitive back and menu buttons at the bottom of the screen (these only light up when you tap on the screen). The tablet runs Android 2.3.5, but the icons that have been used for the interface look to be from Android 2.1 or earlier. The interface looks outdated because of this. But it's worth noting that this isn't meant to be a standard tablet. It's designed primarily with the Budii in mind. As such, it offers features such as intercom (so you can talk to the other phones in your system), voicemail, Fetch TV, and, of course, the iiNet app (so you can check your usage and access some Freezone content). It's actually not a bad little tablet for browsing news sties, watching videos off iiNet's Freezone, and also watching YouTube content (even though there is no app for it). The screen is dull though, so it's best to watch in a darkened environment, and its viewing angles aren't great either. There are limits on what you can do with it, mainly because it doesn't have a link to the Play Store so that you can download other apps, but new features will probably be added via firmware updates, especially once iiNet's SmartLife app is fully developed. As for the DECT phone, it's also based on Android 2.3.5 and it's a handy little smartphone to have lying around the home. When you're not using it for VoIP calls (which it handles very clearly), you can launch the Web browser to read news sites, or fire up the iiNet app to listen to streaming radio or check your data usage. You won't want to use it for watching video because its screen looks terrible in a horizontal orientation. The phone comes with its own little picture frame charger (yes, you can actually insert a printed picture in the frame) so that you can hang the phone up to charge it in another part of your home, not just on the router itself -- it's useful if you want to keep the phone by your bedside or in the kitchen, for example. A port on the rear of the router allows you to use an ordinary analogue phone for VoIP, too. The picture frame charger for the phone. The Budii can be bought outright or rented from iiNet, and it's a device that can be used not only with iiNet but with other ISPs if you ever leave iiNet. 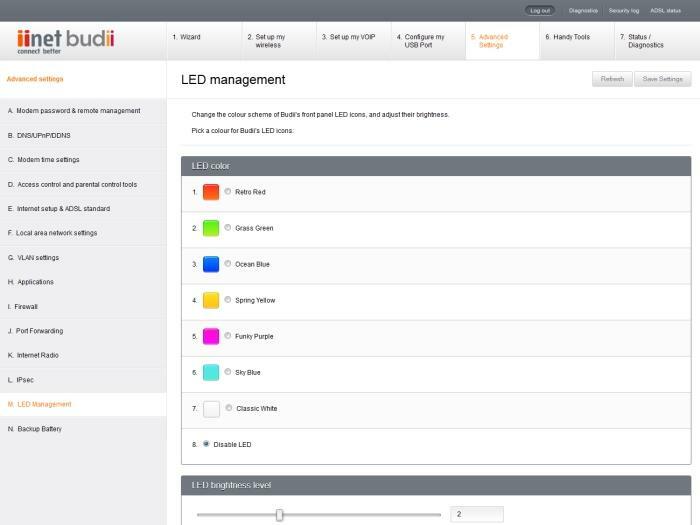 When you order the Budii, iiNet will pre-configure it so that you won't have to do anything except plug in all the cables and switch it on. The pre-configuring includes ISP login details and VoIP settings. 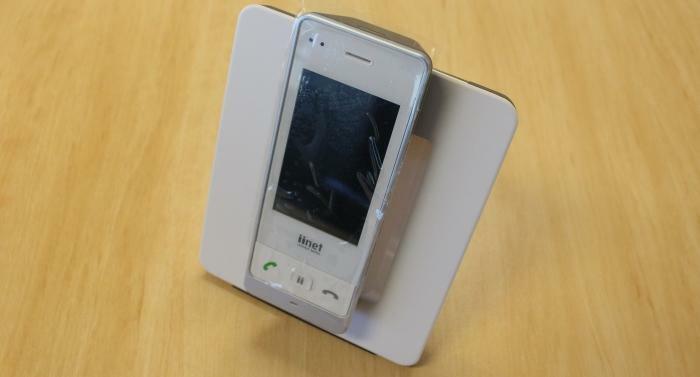 We set it up manually with our iiNet details, but used a third-party VoIP provider (MyNetFone) to test it. It was straightforward to configure for the most part, although we did have to scrounge around a bit to find our correct MyNetFone server details. We were also caught out by the 'save' button being located at the top of the page rather than the bottom, and by some extra SSID fields in the 2.4GHz wireless networking page. The main page of the Web interface. As far as reliability is concerned, the Budii was a little hit and miss during our extensive test period (we used it for a month). In a couple of instances, the router became unresponsive and disconnected from the Internet while we were in the middle of a VoIP call and a wireless (2.4GHz) file transfer. Other times, the DECT phone's operating system became unresponsive and the phone's battery had to be removed in order for it to be restarted. Sometimes, the router lost our VoIP details during a power cycle and we had to re-enter them. We tested with the latest router firmware available at the time (version 1018), but it's still a very new device and there might be some teething problems with it that future firmware updates will address, not only for the modem-router, but also for the handset and tablet devices. The performance of the Budii's wireless network wasn't as fast as we're used to seeing compared to many other dual-band wireless routers that we've tested, but it was serviceable. When transferring files from our wired server to a laptop using an Intel Centrino 6300 Wi-Fi adapter, the Budii recorded short-range (up to 2m away) transfer rates of 5.83 megabytes per second (MBps) for the 2.4GHz network and 10.65MBps for the 5GHz network. From a mid-range distance (up to 10m away), it recorded transfer rates of 6.29MBps for the 2.4GHz network and 10.70MBps for the 5GHz network. The 2.4GHz transfer rates are nowhere near the 8-10MBps that we hoped for, but the fact that it was faster from a longer distance is pleasing. The 5GHz network performance was also a few megabytes per second slower than we expected, but nevertheless solid. Sharing storage devices through the Budii proved to be disappointing, mainly because of the sluggishness of the service. We were able to see our attached hard drives through our smart TV, but browsing folders and loading files took a very long time and video streams took even longer to start playing. The sluggishness of the storage port was confirmed when we transferred files from it to our laptop wirelessly. From 2m away, the transfer rate averaged under 1MBps, and only hit a maximum of 1.8MBps towards the end of our transfers. You can also use 3G mobile broadband dongles through the USB ports, which can be useful if you ever need a backup Internet connection in the event that your ADSL2+ service is down. We used an Optus dongle with an iiNet SIM card without any issues. Other notable features of the Budii include a built-in firewall, QoS, and parental features. You can control connectivity times and also implement keyword-based URL filtering. The latter worked quite well, but it shouldn't be relied upon to block everything (for example, blocked terms were still able to be used in Google Image searches). Our overall impression of this device is fairly positive. We like its design and the fact that it has so much built into it. 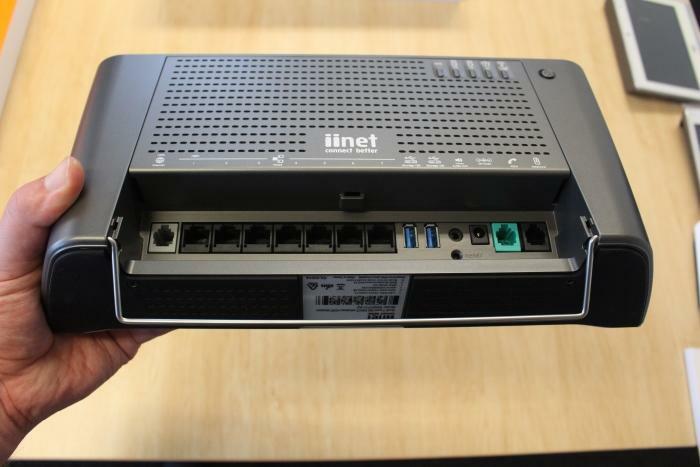 The seven Gigabit Ethernet ports are great, the VoIP function worked well with the Android phone and we're curious to see what iiNet does with the built-in ZigBee chip. However, the storage sharing feature was disappointing, as was the overall wireless performance. These are things that can perhaps be fixed with future firmware upgrades. 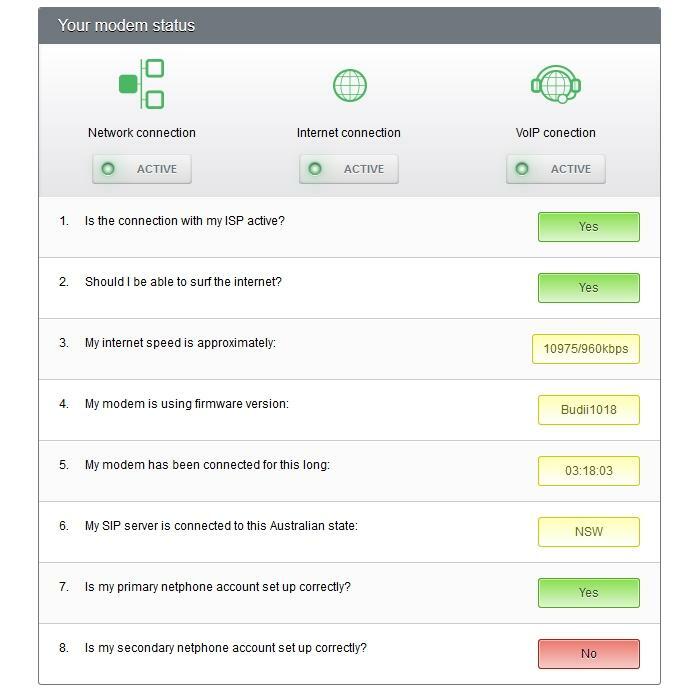 All that said, if you're an existing or future iiNet customer and want an all-in-one modem-router-VoIP device (and more) that won't need setting up and which will be easy for iiNet's support team to troubleshoot if you ever need help, then it's worth considering. You can rent it on a 24-month contract for $19.95 per month without the tablet or $24.95 per month with the tablet, or you can buy it outright for $399 without the tablet if you're a new broadband customer, or $519 with the tablet. It's more expensive to buy if you're not on a contract ($479 without the tablet, and $599 with the tablet).